Frank Geyer (July 28, 1853 – October 4, 1918) was an American police detective from Philadelphia, Pennsylvania, best known for his investigation of H. H. Holmes, one of America's first serial killers. 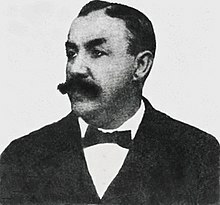 Geyer was a longtime city employee of the Philadelphia Police Department, and in 1894 was assigned to investigate the Holmes-Pitezel Case. He published the story in his book, The Holmes-Pitezel Case: a history of the greatest crime of the century and of the search for the missing Pitezel children. Son of Reuben K. Geyer and Camilla Buck, Frank Geyer died at the age of 65 due to La Grippe (Spanish Flu) and his funeral was attended by hundreds of policemen and detectives. 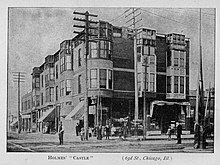 H H Holmes's recorded crimes began in Chicago in 1893 when he opened a hotel called The World's Fair Hotel for the World's Columbian Exposition. The structure, built by Holmes, would later be known as the 'Murder Castle' because of the labyrinthine constructions on the top two floors, which he used to torture and kill many of his victims. In a 1937 article, the Chicago Tribune described: "There were rooms that had no doors. There were doors that had no rooms. A mysterious house it was indeed -- a crooked house, a reflex of the builder's own distorted mind. In that house occurred dark and eerie deeds." H. H. Holmes "Murder Castle"
Boston police inspectors and a Pinkerton detective apprehended Holmes in 1894 in Boston on a coroner's warrant for insurance fraud perpetrated in Philadelphia; however, Boston officials did not find the warrant sufficient to hold Holmes so they contacted Fort Worth, Texas for an outstanding warrant of horse theft. Holmes volunteered to be extradited to Philadelphia for the insurance fraud as he felt he would receive a much lighter sentence. Texas was notorious for rendering harsh sentences to horse thieves. The City of Philadelphia Police Department sent Detective Thomas Crawford to Boston to bring H. H. Holmes and his accomplice, Mrs. Carrie Pitezel, to Philadelphia for a trial. Philadelphia city detective Frank Geyer was tasked with investigating and the trail led him through the Mid West and Toronto, Canada, where he found the remains of two of the Pitezel children. They were the children of Benjamin Pitezel, Holmes's former partner in crime, whom he had murdered to commit life insurance fraud. Pitezel, however, was only involved in fraud and had no knowledge of the murders. The initial investigation was concerned with the insurance fraud but it soon became apparent that Holmes had killed Pitezel. In June 1895 Frank Geyer left Philadelphia to retrace Holmes's steps. His findings in Toronto led to further investigations of Holmes's Chicago property, which sealed his fate. Geyer used information from the unsent letters written by the Pitezel children which, for an unknown reason, were kept by Holmes. In Toronto, he found the bodies of Alice and Nellie Pitezel. He continued his search and found the burnt remains of Howard Pitezel, the third child, in a house Holmes had rented in Irvington, Indianapolis. That same year Frank Geyer published his book detailing the case. In the book George S. Graham, District Attorney of Philadelphia, described the story as "one of the most marvellous [sic] stories of modern times". Several popular books falsely claimed Detective Geyer's wife and twelve-year-old daughter died in a fire shortly after he was assigned to investigate H. H. Holmes and the three missing Pitezel children. However, Geyer's beloved wife and daughter never died in a fire and continued to live well past his death in 1918. In 1896, Detective Geyer became an author and inventor. He authored the Holmes-Pitezel case: a history of the greatest crime of the century and of the search for the missing Pitezel children, which became an instant best seller. Shortly after its release, his "Shutter or Door Fastener" patent application was approved by the United States Patent Office on March 10, 1896, Patent No. 556,141. After 27 years with the City of Philadelphia Police Department, Geyer opened the Frank P. Geyer Detective Agency, located at 1328 Arch Street in Philadelphia and investigated high profile cases, mostly in the Pennsylvania and New Jersey areas. In 1907, he invented the "Safety-Lock for Pocket Books and Hand Bags, which was approved by the Patent Office December 3, 1907, Patent No. 872,619. ^ Geyer, Frank P.; Lawrence J. Gutter Collection of Chicagoana (University of Illinois at Chicago) ICIU (1896). The Holmes-Pitezel case; a history of the greatest crime of the century and of the search for the missing Pitezel children. Philadelphia. Retrieved 2014-12-16. ^ "Holmes Nemesis to Leave Force". Philadelphia Inquirer. August 16, 1903. ^ Crighton, JD (2017). Detective in the White City: The Real Story of Frank Geyer. Murrieta, CA: RW Publishing House. pp. 28–29, 236–237. ISBN 978-1-946100-02-3. ^ "Franklin P. Geyer death certificate". Wikimedia Commons. Retrieved January 22, 2017. ^ Crighton, JD (2017). Detective in the White City: The Real Story of Frank Geyer. Murrieta, CA: RW Publishing House. p. 251. ISBN 978-1-946100-02-3. ^ Benzkofer, Stephan (October 24, 2014). "Chicago's first serial killer". The Chicago Tribune. ^ Geyer, Frank P. (1896). The Holmes-Pitezel case: a history of the greatest crime of the century and of the search for the missing Pitezel children. Philadelphia, PA: Publishers' Union. pp. 143–44. ^ Crighton, JD (2017). Detective in the White City: The Real Story of Frank Geyer. Murrieta, CA: RW Publishing House. pp. 138–41. ISBN 978-1-946100-02-3. ^ "The Holmes Case". Decatur Daily Republican. August 3, 1895. p. 6. ^ David Wencer. "Historicist: H.H. Holmes in Toronto". Torontoist. Retrieved November 24, 2014. ^ Darcia Helle. "The Monstrous H.H. Holmes and His Murder Castle Inc". All Things Crime Blog. Archived from the original on December 3, 2014. Retrieved November 24, 2014. ^ John Bartlow Martin. "The Master of Murder Castle: A Classic of Chicago Crime". Harper's Weekly. Retrieved November 24, 2014. ^ Erik Larson, The Devil in the White City, Vintage Books, 2003, p 385). ^ Katherine Ramsland. "H. H. Holmes: Master of Illusion". Crime Library - Criminal Minds & Methods. Archived from the original on November 29, 2014. Retrieved November 24, 2014. ^ Schechter, Harold (1994). Depraved: The Definitive True Story of H. H. Holmes, Whose Grotesque Crimes Shattered Turn-of-the-Century Chicago. New York, NY: Pocket Books, a division of Simon & Schuster. pp. 247–48. ^ Ramsland, PhD, Katherine (2009). The Devil's Dozen: 12 Notorious Serial Killers Caught by Cutting-Edge Forensics. New York: Berkley Books. pp. 21–22. ISBN 978-0-425-27077-6. ^ Larson, Eric (2003). The Devil in the White City: Murder, Magic, and Madness at the Fair that Changed America. New York: Vintage Books, a Division of Random House, Inc. p. 340. ISBN 0-375-72560-1. ^ Nickels, Judith (2014). A Competent Witness: Georgiana Yoke and the Trial of H. H. Holmes. CreateSpace Independent Publishing Platform. p. 155. ^ Ramsland, Ph.D, Katherine (2007). Beating the Devil's Game: A History of Forensic Science and Criminal Investigation. New York: Berkley Books. p. 152. ^ Crighton, JD (2017). Detective in the White City: The Real Story of Frank Geyer. Murrieta, CA: RW Publishing House. pp. 3–8. ISBN 978-1-946100-02-3. ^ Franklin P. Geyer (age 31, detective) married Mary Elizabeth Rilley (age 27) on March 9, 1885. Methodist Midtown Parish Church Marriage Record, 1885. ^ Edna Camilla Geyer. Department of Records, Philadelphia City Births, December 27, 1886. ^ 1900 United States Census, Philadelphia, PA for Frank Geyer, Detective, Mary Geyer, wife, Edna Geyer, daughter. ^ "Pupils Pass to Higher Studies [Edna C. Geyer]". Philadelphia Inquirer. June 28, 1901. p. 9. ^ "Strohm-Geyer [Edna Camilla Geyer married Orrie Curtis Strohm, daughter of Philadelphia city detective Frank Geyer]". Bridgeton Evening News. April 23, 1908. p. 6. ^ "Bury Detective F. P. Geyer [Geyer's estate bequeathed to his wife, Mary, and daughter, Edna C. Strohm]". Philadelphia Inquirer. October 9, 1918. p. 10. ^ Crighton, JD (2017). Detective in the White City: The Real Story of Frank Geyer. Murrieta, CA: RW Publishing House. pp. 210–14, 242–45. ISBN 978-1-946100-02-3. ^ "Geyer Detective Agency Ad". Philadelphia Inquirer. September 13, 1908. p. 3. ^ "Miscellaneous Bills [Bucks County paid Detective Geyer for services]". The Central News. January 26, 1916. p. 7. ^ "Fake Mustaches". Wilkes-Barre Times. September 6, 1909. p. 9. ^ "Strong Murderer Declares Medium". Philadelphia Inquirer. March 29, 1911. p. 16. ^ Detective Frank P. Geyer's Patent No. 872,619, December 3, 1907. United States Patent Office.